Break Fast, Lunch or Dinner | I Am Not A Restaurant! I always say if you can't cook, cook soup. It's nearly impossible to make an unfixable mistake. Soup is meat and/or veg with liquid of almost any kind. It can be vegan, gluten free or grain rich, dairy-centric or not, and an easy way to get vegetables into haters. They're not hiding, they're puréed. For the annual bagel and smoked fish bonanza I've been hosting at the end of Yom Kippur, I've recently added a couple of soup selections. This year chicken with matzah ball and the roasted eggplant tomato. I didn't roast the tomatoes as they were farmer's market seconds that needed too much skinning and trimming (but a bargain!). But beautiful romas could easily be halved, dressed with olive oil and sent to the oven with the eggplant. 5-ish pounds of fresh tomatoes, seeded. Peel if desired. Over medium heat drizzle olive oil in stock pot or Dutch oven. Melt onion 5-10 minutes, adding carrots halfway through. Add tomatoes, a few good pinches of salt, pepper if preferred and cook a good 20 minutes, lowering the heat when it's super bubbly. Meanwhile, preheat oven 425. Drizzle olive oil over garlic, wrap in foil and put in oven. Toss eggplant with enough olive oil to cover and put on baking sheet in oven. Eggplant takes about 20 minutes depending on size, garlic about 10-15 minutes longer. If it gets too hot, turn down the heat. Add basil and all but 2 handfuls of eggplant to the stock pot. Squeeze out the roasted garlic, spread one on toast and add the rest to the stock pot. Eat the toast. Purée the soup and return to pot, adding stock or water for desired consistency. Heat through with the rest of the eggplant. Adjust seasonings. Note: my daughter said it needed something crunchy. Croutons: cut stale bread into cubes of any size. Drizzle with olive oil. Toast in fry pan (or oven!) sprinkled with herbs of choice…garlic powder, kosher salt, thyme etc. Toss to avoid burning, turn off heat when crunchy, and toss with Parmesan. Store in zip top. 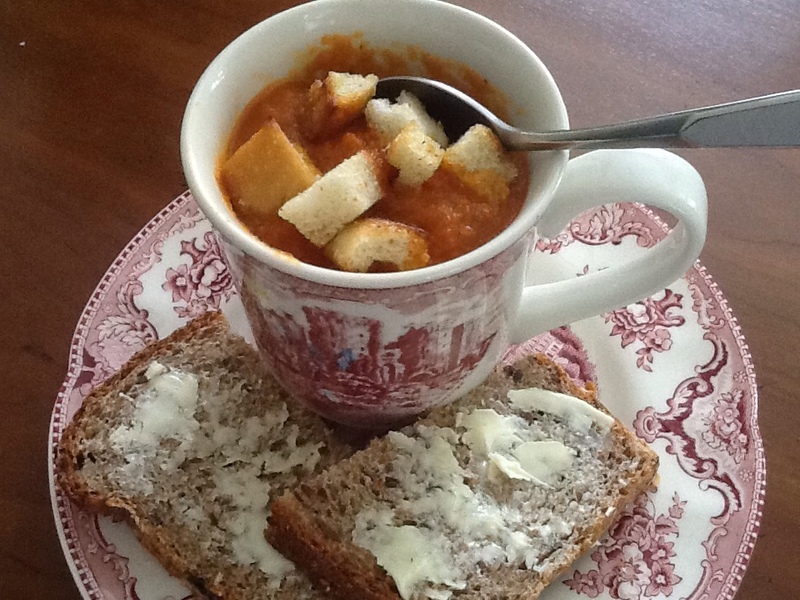 Sep17September 17, 2013 • By Betsy Karetnick • This entry was posted in Dish of the Day, Kitchen Help, Recipes, Soup and tagged Break Fast, croutons, eggplant, roasted tomatoes, tomato soup, Yom Kippur. Bookmark the permalink. I just made this. Actually I made something inspired by this recipe. I roasted the tomatoes first, then added the eggplant and garlic. I had a bowl for linner and froze the rest in 2 cup packages for lunches. Yum! Yum – sounds amazing! I make a similar soup but without the eggplant. Will try it with the added vegetable, which I’m sure will enhance the flavor. and lucky for me you are my biggest fan! Delicious. Best soup I ever had! Really.